What's the matter with Camden? Camden was not always America’s poorest, most crime-ridden city, with scores of open-air drug markets driving children indoors and property values to bedrock lows. Yet when the New Jersey city’s collapse came, it was stark and complete. Civic mismanagement, soaring crime rates, and the flight of business all contributed to Camden’s precipitous decline, the city a victim of industrial forces that shaped the 20th century and left residents stranded. Surrounded by affluent suburbs, Camden shows an ugly face of America that many would rather ignore. How bad is the crime problem? Camden had the highest crime rate of any city in the country in 2011, according to a review of FBI data by CQ Press. It’s not just the number, but the desperation and gruesomeness of the crimes that is startling. A mother who decapitated her 2-year-old son and a man who killed a 6-year-old boy accounted for but two of the city’s record number of murders in 2012. At the same time, the drug problem has continued to grow, with an estimated 175 open-air drug markets scattered across the crumbling city. Now, officials are planning to disband the more than 140-year-old police force and replace it with county cops, due to arrive in April. There were nearly 70 murders in the city in 2012, almost one for every 1,000 people. How poor are the people? Among the nation’s poorest, according to 2011 census data, with 42.5 percent of the city’s 77,000 residents thought to be living below the poverty line. The city's median household income was $21,191, lowest among the cities surveyed by the U.S. Census. And this is in one of the nation’s richest states. 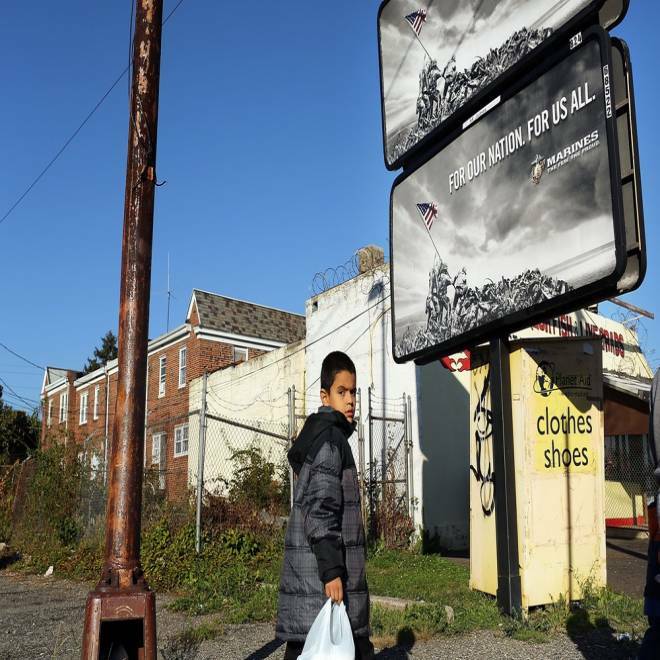 Children in Camden were far more likely than children in the surrounding county or state to live in poverty according to a 2007 report by the Legal Services of New Jersey. A set of charter schools have made some inroads in the city, but the problems for most students remain dire. The graduation rate for Camden high school students was just 49 percent in 2012, according to the state Department of Education. The problem isn't even money, as Camden spent $19,204 per student in the 2011-12 school year, according to the state education department’s Education Funding Report. However, only 1.4 percent of the city’s students met the state’s College-Readiness Benchmark, the report noted. Compounding the problem is that plenty of children aren’t getting basic nutrition before showing up in the classroom, said Michael Moynihan, president at the United Way of Camden County. “If kids don’t eat breakfast, they can’t learn,” Moynihan said. A pilot breakfast program at six schools started by the United Way shot up to include 84 percent of eligible students, and may be expanded to the rest of the city’s 26 schools. In Camden, N.J., criminals and drug deals operate in the open, and the police department is understaffed. But some residents are working hard to get their city back on track. NBC's Brian Williams reports. In the cases of at least three mayors in the last 30 years, the most noteworthy thing politicians have done is go to jail. The scandalous streak began with Angelo Errichetti, a son of the city and former Camden high school footballer who was caught up in the government’s Abscam probe – an FBI sting that targeted public corruption – and convicted of bribery in 1983. Arnold Webster served as mayor from 1994 to 1997 before pleading guilty to fraud charges in 1998. Webster’s successor, Milton Milan, was sentenced to more than seven years in federal prison in 2001 on bribery, money laundering, and racketeering charges.